LaVere Redfield was a prolific hoarder. When he died in 1974, his estate was estimated at more than $70 million. Executors found 680 bags of silver coins and 407,000 Morgan and Peace silver dollars in his Reno mansion. A local Reno legend, Redfield gambled regularly in Virginia Street casinos. He survived robbery and burglaries of his home, which contained false walls to store millions of silver dollars. Hating banks and paper money, as well as big government, Redfield opted to serve a prison term for income tax evasion rather than pay his debts from his ample fortune. Join author Jack Harpster for this first book-length study of this unconventional man behind the folklore and the myth. Interpretations of the life of late Reno millionaire LaVere Redfield have often been more rumors than reality, more folklore than fact. In the years since his death in 1974, it seems Redfield, who could often be seen about town in coveralls, plaid shirt and work boots, has morphed into a northern Nevada version of Howard Hughes — eccentric and paranoid, a recluse in the stone mansion he shared with his wife on Mt. Rose Street. Jack Harpster, a retired newspaperman and author of seven other books in the biography genre, heard many of those Redfield stories after moving to Reno a decade ago. "I heard a lot of myths and legends," Harpster said. "I thought he'd be an interesting guy to do some research on, so I started going through the old newspapers. It was a treasure trove." What he found that LaVere Redfield was a complicated man and many of the stories were simply myths. "Redfield had an awful lot of good qualities," Harpster said. "He was also a scoundrel in a lot of ways." 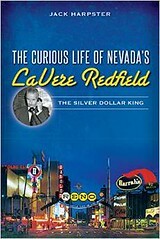 The newspaper coverage on Redfield — starting with a story about his being mugged on Forest Street by a brick-wielding robber who hit Redfield in the head multiple times — became the backbone of Harpster's latest biography, "The Curious Life of Nevada's LaVere Redfield: The Silver Dollar King," released this month from The History Press. Harpster augmented his research with interviews of more than 20 people who knew Redfield personally or had close interaction with him. To be sure, he said, Redfield was an interesting character: a keen investor in the stock market and real estate; anti-government (especially the IRS); a ruthless businessman; a man who didn't trust banks; a high-stakes gambler; a philanderer; a victim of at least two high-profile robberies; a man who hated to have his photo taken and a notorious hoarder. At the time of his death, Redfield's estate was valued at more than $70 million and executors found hundreds of bags of silver coins stashed in the garage of his Reno mansion. His largesse in gambling was opposite of his penny pinching in his business and personal dealings, Harpster found in his research. Redfield was involved in more than a dozen lawsuits and frequented city council and county commission meetings in an effort to get his property taxes reduced. Despite owning numerous vehicles, Redfield would walk from the mansion on Forest Street to downtown Reno to gamble because he didn't want to spend money on gas to drive there. He preferred to wear overalls or a flannel shirt and jeans mainly because he didn't want to be recognized, Harpster said. He once pleaded with Reno Evening Gazette publisher Rollan Melton to keep the newspaper photographers from taking his photo, again, because he didn't want people to know what he looked like. For many years, rumors have persisted that the more than 400,000 silver dollars found hidden in Redfield's garage and mansion after his death were only a part of his treasure, that more might be buried elsewhere. "Personally, I don't believe so," he said, but then added. "If the house ever gets torn down, I hope they do it carefully."